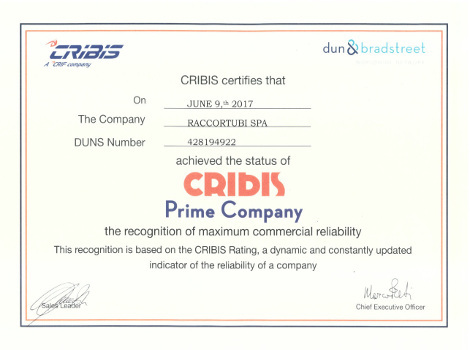 Raccortubi Spa has been awarded the Prime Company certificate by CRIBIS / Dun & Bradstreet, a company specialized in providing commercial information about Italian and foreign firms. The recognition, issued on the CRIBIS Rating following the analysis of parameters such as company age, financial soundness and payment conditions, certifies the company’s highest commitment to reliability with regard to its commercial relationships, showing also its virtuosity towards suppliers. With just a 7.6% rate of CRIBIS Prime Companies in Italy (CRIBIS figures as at December 2016), achieving the recognition is an even more important accomplishment for Raccortubi Spa and the Group it leads, which can boast an international commercial network thanks to its manufacturing plants in the province of Piacenza as well as its stockholding subsidiaries in the world. It is, thus, a reinforcement of the long-lasting partnerships with customers and suppliers the Group has been able to build up over the years both in Italy and abroad, constituting also the proof that precision, quality and dedication are the foundations of trust for profitable business relations.